I did it! 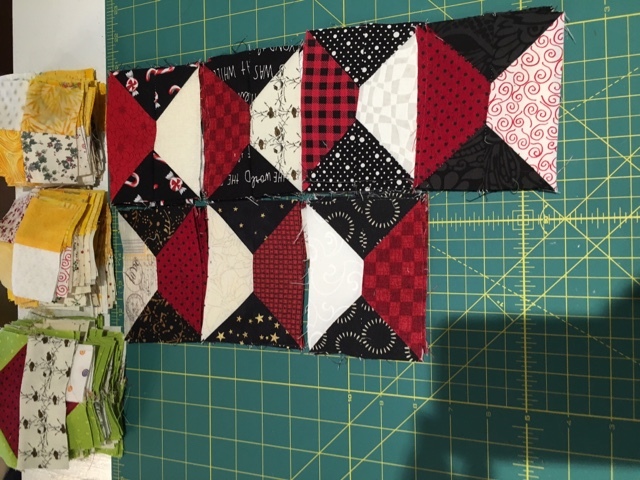 I finally got the borders on Bonnie Hunter's Easy Street last night, I had thought I would get them on during the school week, but I came down with a sinus infection that kicked out all my energy. So I got them on during the football games on Saturday. 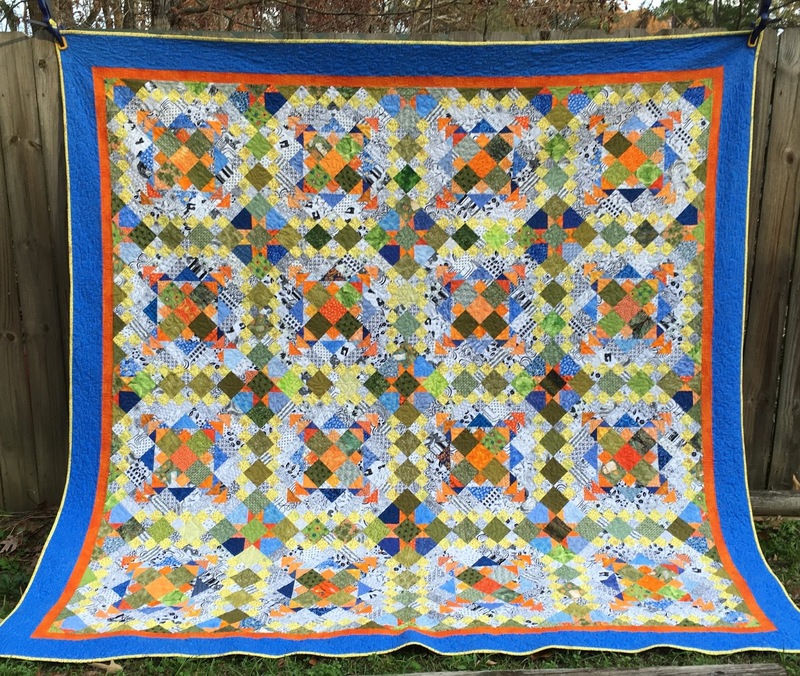 I was hoping the blue border would bring out the blue in the quilt, and it did help but not as much as I had hoped. I am so thankful for my family, my home, my job with wonderful students that I love and my most importantly, my savior Jesus Christ. May all of you find the comfort in his arms that I have. I hope you are having a wonderful weekend. It was an absolutely gorgeous day here in Mississippi. One of those fall days that is bright, clear, crisp and cool. Just a perfect day. I got up and drove to Ridgeland Berninia Sewing Etc store to take a certification class to be able to rent a long arm machine. 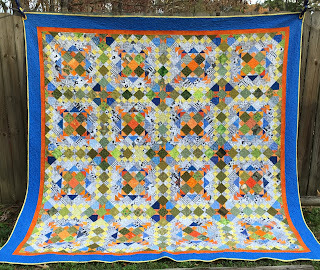 To buy this sweet baby would not be worth it for the number of quilts I do...unless I did it as a business. I don't think that is my calling at this point. 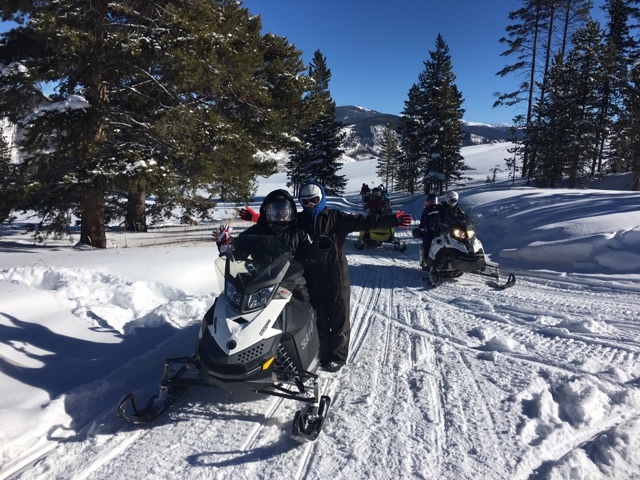 It was fun and I need a LOT more practice... many of my curves were not curved, so there will be a learning curve....pun intended. I booked the machine for the Monday of Thanksgiving week and I bought some olive material that was marked down to use as the backing. 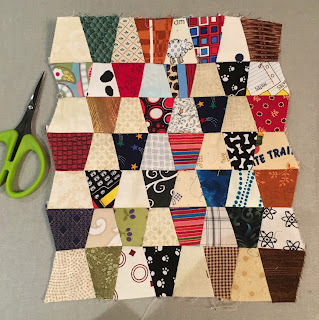 Since I am not happy with my Easy street quilt, I am going to use it as my practice quilt. Before they let me test drive this baby, they showed us how to put zippers on the the backing. That will allow you to quickly put your backing on the long arm. I was better at the sit down machine, but I don't see me renting it, as I have my Juki at home. It does have the advantage as it has a stitch regulator on it and my Juki doesn't. So I will need to finish getting my Easy Street top together to use as a practice piece. Labels: Berninia sewing etc., Bonnie Hunter, Easy Street, long arm quilter. I was reading some of the quiltville FB group posts about their mystery quilt fabrics and decided to take black and white photos of my fabric and possibly change some out. 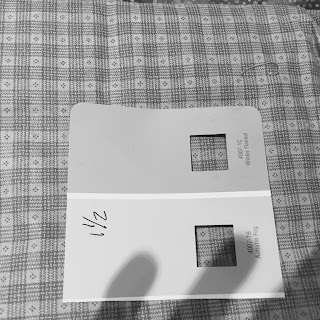 So I had this other green and I tried it...the lighter part of the check was not too far off, so maybe it will do but it is not near as pretty in color. It is closer, but I am not sure I like it enough...I may go back to looking for a grey. My colors did not right amount of contrast and were too busy...sigh. 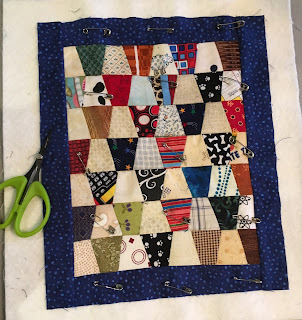 I am going to keep going and and maybe it will be ok once it is quilted. If you look in the bottom corner you can see some of the fabrics I am auditioning for the border...maybe that will be in the border. 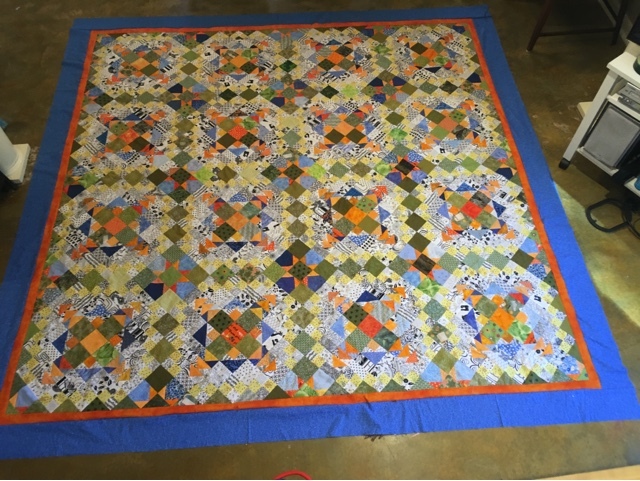 I am leaning toward the orange inner border and maybe the blue and bound in green. What I am really pleased with tho is a leader-ender I have been doing between joining pieces is the scrappy mountain quilt also by Bonnie Hunter. Here is a link to her page and the instructions. It is on her free tab of her blog. I have made 84 of these and will probably shoot for 110. They go together really fast. I am super excited because I signed up with Bernina Sewing Etc, shop to get certified to run a long arm machine. I do that next week. I will let you know how it goes. Hope you have a great week. It is mystery time again!! This year I am in a position to do it!! I am working on finishing the mystery from two years ago. 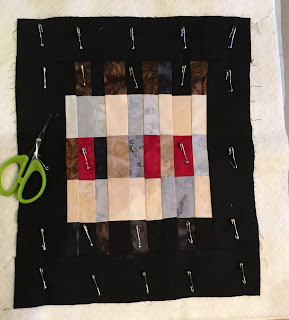 Not loving it, but I have all the units made so it needs to be a quilt. When I finish if I don't love it, I can always gift it to someone. I think I can be done by Thanksgiving. :)! 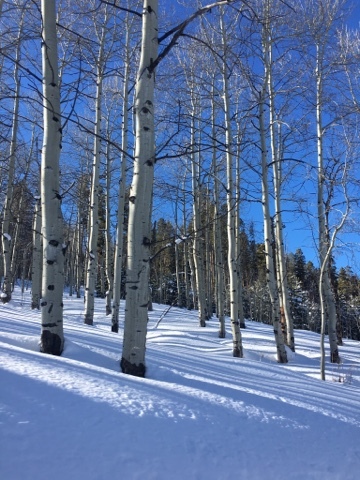 If you want to join in the current Bonnie Hunter mystery, here is a link to her blog post about it. She gives great instructions. This year it is called Allietare, which is an Italian word meaning to gladden or to rejoice! Bonnie gives the numbers to paint cards to help guide you in picking your fabrics, but she does not mind if you change things up. A matter of fact, I think she likes seeing her designs in other color ways. It looks like Christmas if you change the grey to green. I think I am liking that! 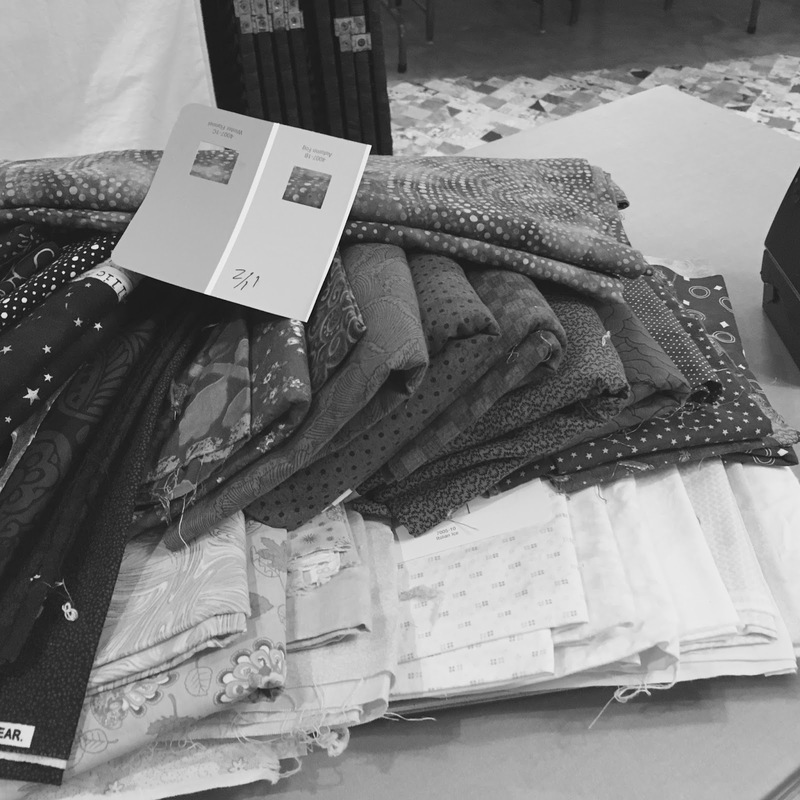 .I have so much fabric, I really seems a shame to not sew with what I have. Decisions, decisions!!! Will came last week end and hung my magnolia quilt. I love it there. I sent Coteworth's Cat to live at his house and he said the colors were great in the room he plans to hang it. Now I need to finish a project to cover my fuse box in my laundry room, where it had been hanging. 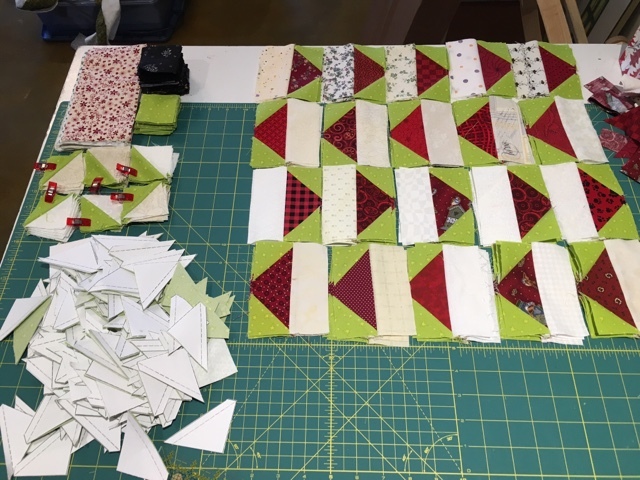 I have finished the little mini quilts that I started for the practice for quilting. 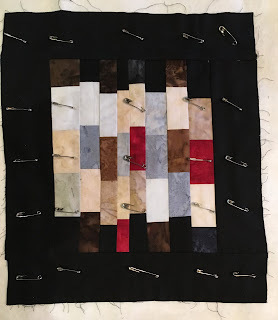 I did the micro quilting on the first one. 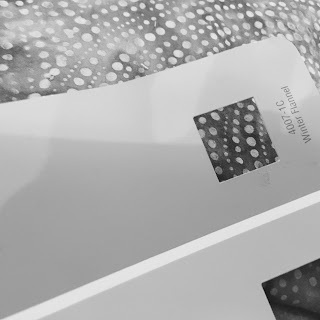 Cross hatching on the second one. And a radiant look on the third one. For the spools I did free motion circles on the lights, and used my walking foot to stitch in the ditch for the inner part and did gentle curve in the border. Today I worked on the next lesson, cross hatching but I don't have that project quite finished to photograph. My other project this weekend was to change a cabinet in my kitchen around. Even tho my kitchen is big, I had a big pantry in Columbus and I was missing that type of storage. I wanted a place to store some of the things that didn't seem to have a good place in this kitchen. But at the same time, I would need a place for brooms and tall things like that. So what I decided to do was to but shelves that were 9 inches deep in. That would leave 2 inches that would accommodate the broom or mop handles. So, thought the best way to do this would be to add adjustable shelving. So I had been thinking about this and planning to put a level and measure to where each hole would be, and I had been worried that I would not be able to be consistent enough to make all the shelve sit level. So today I had a breakthrough. I decided to take a board and use my drill press to put the holes in that would act as guides to drill the holes in the cabinet. It worked like a charm. And boy did it make putting the supports in easy. No marking on the walls or trying to measure and level all at the same time! So I put the holes in and cut the shelves with my table saw. So that looked great. Added the shelves and now have a basket for nuts, and one for onions and one for potatoes. And I still have room canned goods or cook books...I haven't decided which will be better to put where. I can readjust the height if needed. So feeling rather productive tonight! 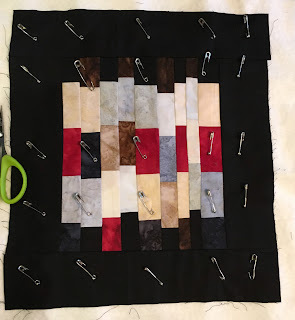 Think this technique would work well if any of my quilty friends need to change up a closet for fabric! 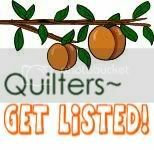 Our guild, Possum Town Quilters, is going to host the Mississippi Quilting Association next year and we are considering different fund raisers. One is to have a silent auction of mini quilts that people can hang as art pieces or use on a table. I also signed up to take a machine quilting with your walking foot class from Craftsy.com taught by Jacquie Gering. So I decided to combine the goals of making something for the guild, trying the techniques that Jacquie was teaching, and learning to use my new Juki. 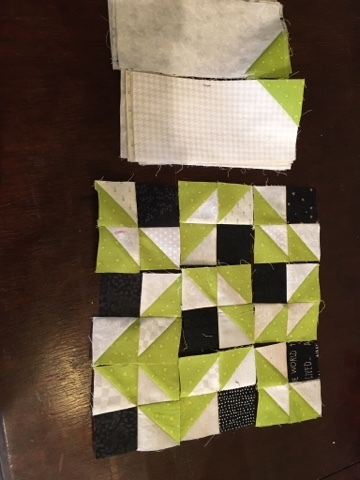 So last week I made a mini tumbler quilt and I took my scraps from the quilt I made for my son and sewed them together to make 3 other mini quilts. So I put the Juki back out and started micro quilting this morning. About an hour and half in it started making a noise then locked up. So I have a trip to Meridian in my future. Ugh. They got on the phone with me and we tried for about a half hour to get it going but determined that it was not something I could fix. I hope it is an easy fix. So frustrated. So I put it aside and got the Bernina back out and finished it up and trimmed it. 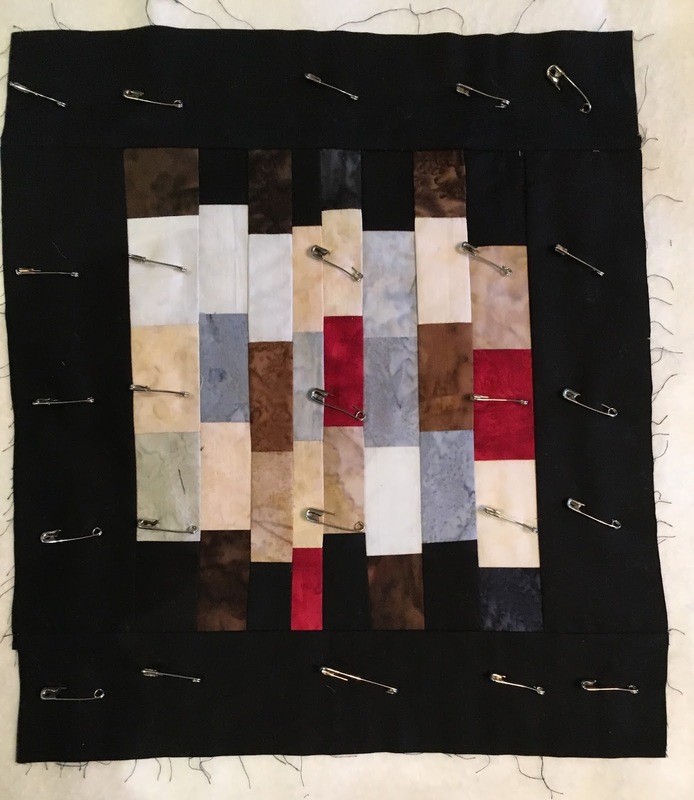 I still need to bind and name it, but I did the micro quilting. Not sure it was the best choice for this project but I needed to practice it. 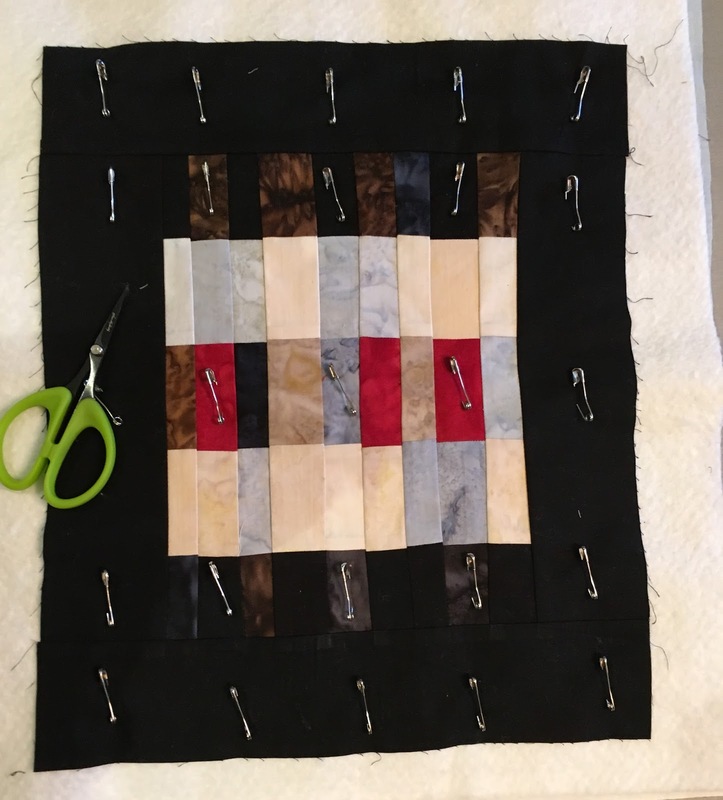 It makes a quilt really stiff so it is only a technique I would want to use on a wall hanging. 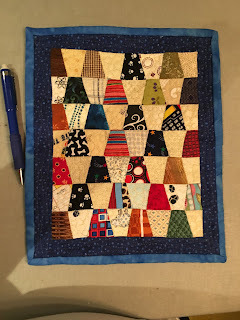 I used a variegated thread for the quilting. The colors in it go from brown to cream although it looks white in the photo. If you have any suggestions for a name let me know. I will probably bind in red or blue. Last month at Possum Town Quilters sit and sew meeting we had a Jelly Roll Race. 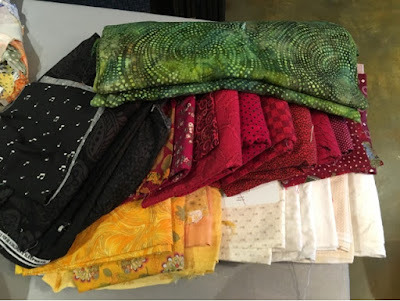 Terri (another member) presented some options if you did not want to do the typical Jelly Roll race quilt. She showed how to do the 3 dudes quilting pattern that Jenny Doan did on a Missouri Star quilt tutorial. You can link to that here. My son had wanted a quilt to use as a spread in his guest room. So I had been on the lookout for a pattern that would make up pretty quickly as it did not have a spread at all. We had discussed using the colors in an area rug he had in the guest room. The room is painted blue. 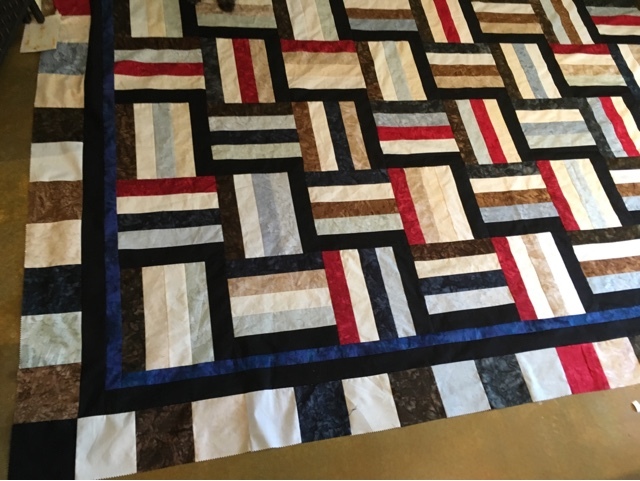 I did not want to make the original Jelly Roll Quilt as I had made two of those already. 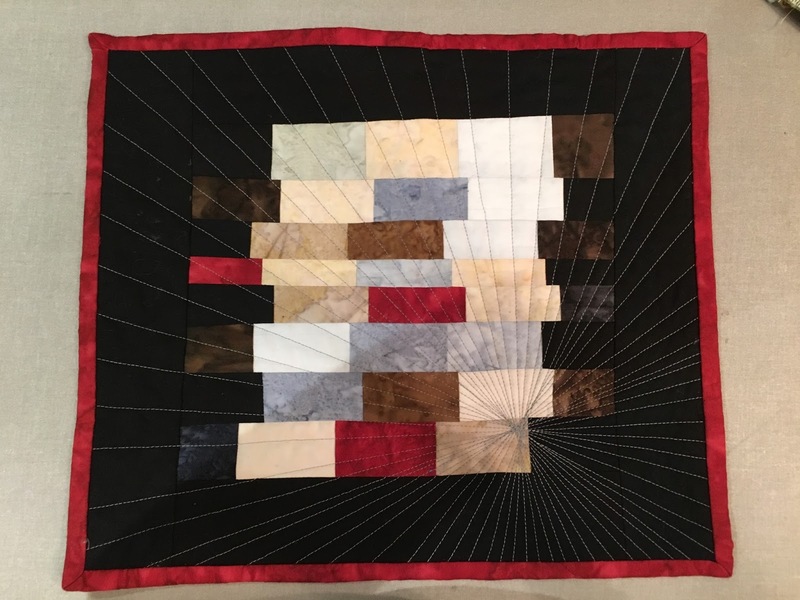 Since I had made the JJ Knox quilt and had gotten a lot of good feedback decided that would be a good direction to go. So in order to make it big enough for a queen sized bed, I figured out I would need two jelly rolls. I was using the Artisan Batiks - Prisma Dye Neutral Nuance Roll Up by Lunn Studio for Robert Kaufman. After I had those in my home, I decided that I should add a few red strips and add enough of the black/blue so that each set of 5 would have a black strips in it. So I ordered the extra fabric and two charm square packs to use in the border. I was also planning to use the black/blue in the border. 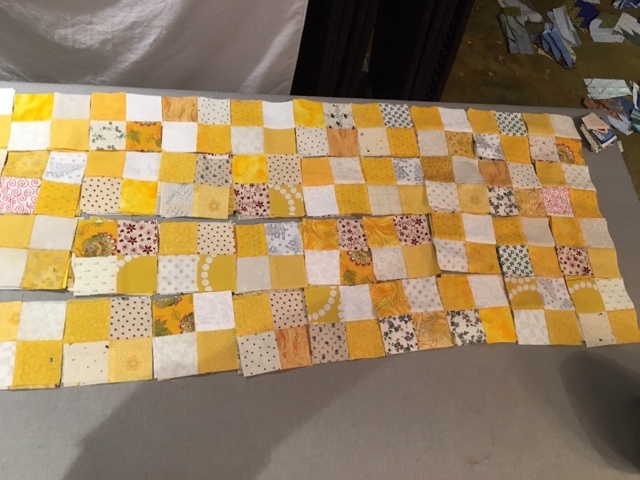 I cut each strip in half and pinned them in groups of five so there would be a good bit of variety in the blocks. At the sit and sew I got about half the blocks done. I finished them over the next few days. 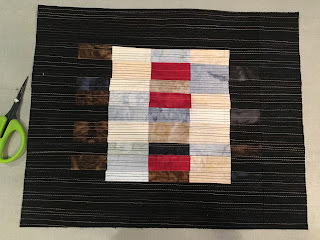 After I got the center done, I decided I needed something between the black border and the body of the quilt. On a trip to Birmingham, we stopped in Tuscaloosa and bought the bright blue to break it up. There were lots of pretty quilt tops made that day. Check out what you can make with a Jelly Roll and you can produce a quilt top quickly! Since I had the day off Monday and had the borders on by about noon, I decided to take it to Betty Lewis to quilt. 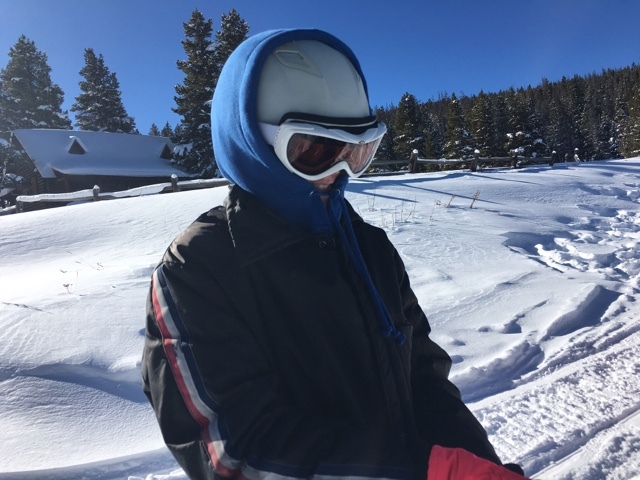 That way I could still get back home to verify grades for the end of the 1st 9 weeks for school. 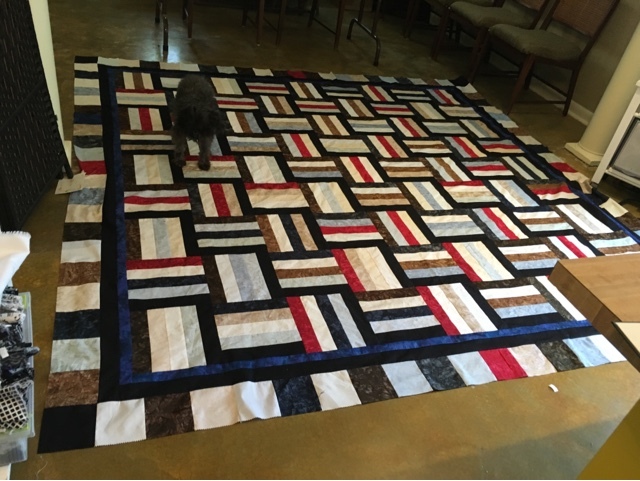 I was nervous about doing such a large quilt on my new machine. It is about 103" x 103"! So I decided I will try that out on my next quilt.